Holly of the South Orange, New Jersey radio station WSOU recently conducted an interview with MEGADETH bassist David Ellefson. You can now listen to the chat using the SoundCloud widget below. A couple of excerpts follow (transcribed by BLABBERMOUTH.NET). Ellefson: "It's been great. Even when I came back in the band in 2010, you could really just feel it throughout the metal community; it was a very big thing to be celebrated, MEGADETH being such a fan favorite in our genre. And I think Dave [Mustaine, MEGADETH leader] and I, we reconciled on all fronts and things coming back together, that doesn't always happen in a lot of bands. And I think that that was really… it was something that we certainly were happy about, the fans were thrilled, concert arenas were packed again and things were nice. And then, of course, rolling into the 'Big Four' [shows with METALLICA, SLAYER and ANTHRAX], and the 'American Carnage' [tour] that we did with SLAYER and MEGADETH. So, I mean, there were just a lot of really big things at that time. And then you fast forward now to current day, with Kiko [Loureiro, guitar] coming into the group, who's just a terrific musician and just a really good fit, personality-wise, in the band. And the same with Chris [Adler, drums]. Chris is not only celebrated for LAMB OF GOD, but as a MEGADETH drummer, he's phenomenal. He really does the new songs so well and really does justice to the back catalogue as well." 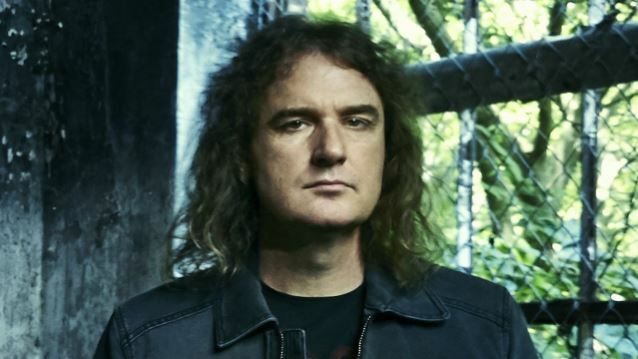 Ellefson: "Well, look, we want him as often as we can have him. And there were a couple of shows, as we started on a round-the-world trip back in October that he wasn't able to participate in, 'cause they were wrapping up a LAMB OF GOD tour down in South America. And Tony [Laureano], our drum tech, but I don't want it… That almost sounds like he's just a work-for-hire employee, but the truth of it is he has his own incredible resumé as a drummer. He's from the Tampa area and played with DIMMU BORGIR and has just a great resumé as a drummer. And he's been kind enough and gracious enough to work, doing some tech work with us. And we realized, 'Man, we've got a terrific drummer in-house' that was able to cover for some shows. Now, coming up, moving forward, LAMB OF GOD has a full year, MEGADETH has a very full year, and we're gonna try to make that work between both of the bands and the schedules. But we'll see how it plays out. Like I said, we want Chris as much and as often as we can have him, especially now that [his contributions can be heard] on [MEGADETH's latest album] 'Dystopia', and I think the fans would love to hear him play those songs with MEGADETH live." On April 8, Universal Music / Tradecraft / T-Boy Records will issue "Dystopia" as a limited-edition vinyl picture disc featuring the album's vivid dark and chilling artwork which takes the bands long-time mascot Vic Rattlehead to a whole new level and drops him into a bleak, futuristic dystopian universe. The "Dystopia" picture disc can be ordered individually at all participating retail and online outlets or at UMv as part of a specially priced pack with other picture disc titles including "Peace Sells…But Who's Buying? ", "So Far, So Good…So What! ", "Rust In Peace", "Countdown To Extinction" and "Youthanasia".